But the forests are threatened by the construction of a 260 kilometre-long super highway. On 20 October 2015, Nigeria’s President, Muhammadu Buhari, and the Governor of Cross River State, Benedict Ayade, took part in a ground breaking ceremony to launch the super highway. The Ekuri Community Forest lies on the proposed route of the highway. The Ekuri are dependent on the forests for their livelihoods. 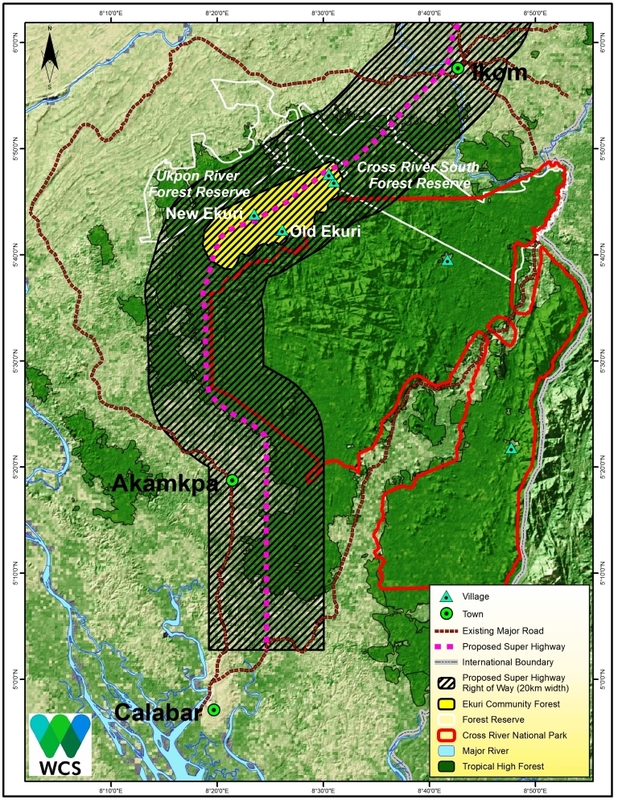 The Ekuri communities have successfully defended their 33,600-hectare community forest against logging concessions, and in 2004 the Ekuri Initiative won the UNDP Equator Award. The situation today is frightening. A bulldozer was sent to Ekuri four days ago to commence work, but the Ekuri people did not co-operate with the operators. They were denied accommodation in the community and casual workers to support their work. Just yesterday the bulldozer was removed from Ekuri to Etara/Eyeyen communities sister communities to Ekuri, and massive destruction is going on there now. Women and Children are lamenting the lost of their farms without hope for compensation. There are only around 300 members of the Cross River gorilla species remaining in the world. They are shy and avoid humans. The damage caused by this road could lead to their extinction. Other ways must be found. The International Primate Protection League stands with the Ekuri people in calling for the plan to be withdrawn in its current form. Leave it alone. Its needed.